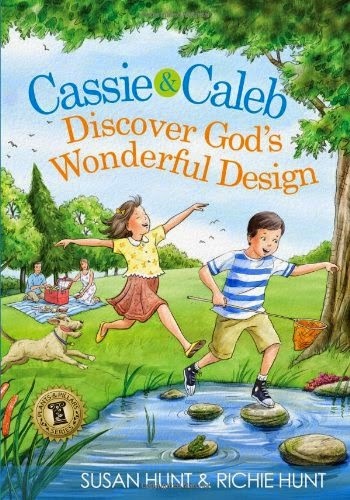 Behold & Reflect: Review of "Cassie & Caleb Discover God’s Wonderful Design"
Review of "Cassie & Caleb Discover God’s Wonderful Design"
I’m going to partially blame myself for misunderstanding what this book was. When I saw the siblings frolicking across stones in a frog pond on the cover of Cassie & Caleb Discover God’s Wonderful Design, I assumed it was going to be a devotional exploring how the wonders of nature reveal our Creator’s wisdom. When I read the back cover, which states that from reading these twenty devotions, “your children will learn: The creational principle that ‘God created man in his own image…male and female he created them’ (Genesis 1:27) is extraordinary!” I still did not realize this devotional, written by Susan Hunt and Richie Hunt and published by Moody, focuses specifically on gender roles and the differences between boys and girls. I don’t dispute the biological, hormonal and cultural differences between the sexes, but I’m sensitive about how I approach these differences with my boys, because I don’t want to cultivate potentially harmful stereotypes in their impressionable minds. Similar to the Hunts’ book My ABC Bible Verses, which my oldest son enjoyed when he was in preschool, Cassie & Caleb teaches biblical principles by following siblings through their quintessential childhood experiences. At 96 pages, Cassie & Caleb is geared toward 5- to 8-year-olds. Unlike My ABC Bible Verses, it is illustrated with dreamy-eyed children in an array of nationalities. Each chapter also contains a two-page story, discussion questions, Catechism questions to memorize and a prayer prompt. The inescapable theme of this book is that God created males to be the adventurous, leaders and breadwinners and females to be the tender, weaker nurturer in a supporting role to men. For example, as the family discusses Genesis 2 around the dinner table in one story, Caleb comments, “It seems to me… that Adam was not acting like a man. He didn’t lead the woman by reminding her of God’s Word” (62). Boys are also portrayed as more naturally rough and tumble than their delicate counterparts. In another story, Caleb and his buddy sneak up behind Cassie and her friend and pummel them with mud until they scream. Instead of chiding them, the older, wiser adults chuckle at the mud-slingers with a “boys will be boys” attitude until the girls eventually laugh at their mud-soaked situation too. The story is innocent enough, and I agree that none of us should take ourselves too seriously, but something about it didn’t sit right with me. My three boys get muddy and barefoot in the back yard all summer long, but I would not condone them if they ambushed unsuspecting children, be they girls or boys. As with any stereotype, I don’t believe the one presented here fits every man or woman, nor do I believe God even intends that it should. However, I appreciated that the Hunts were careful to avoid being heavy-handed in their presentation of a complementarian viewpoint. For example, Dad is seen washing dishes, and Cassie’s friends are presented as having a variety of interests from softball and fishing to frilly clothes and the color pink. The book emphasizes equality between men and women despite their differing roles and promotes godly character for both men and women, touching on topics such as pride, forgiveness, and gratefulness. I liked that the main characters often make decisions against the grain of peer pressure. For example, in one episode, Caleb talks his friend out of sneaking into a scary movie after they’ve purchased tickets for an age-appropriate one. I think the book also emphasizes grace and provides models for healthy conflict resolution. For example, all of the characters, including Mom and Dad, have moments of weakness and sin, and all are able to own up to their mistakes or forgive each other their failings at the end of each story. For these reasons, I thought Cassie & Caleb was a step up from My ABC Bible Verses, in which the parents were perfect, the younger sister was always the little angel and the older brother the family’s Goofus. Because I’d like to present a more nuanced take on what makes men and women different and how every individual can uniquely serve and express their maker, I probably won’t be reading this book to my "everything is black or white" 6-year-old just yet. However, I would recommend the book to families comfortable with a complementarian view and looking for a devotional that will likely capture young children’s attention with gospel-oriented stories. A Give-Away... Might make a good Christmas gift! What kind of devotionals have you done or are you doing with your children? What conversations have you had with your children about being a boy or girl? What questions have your children asked you, and how have you answered? Right now we are just reading various books collected since Beau's childhood on the Christmas story. We talk about what Christmas really is and why we celebrate Christmas. It's fun to read from different stories so they get it a new way each day. We are also about to start some activies out of the ADVENTure of Christmas book by Lisa Whelchel. It talks about the colors of Christmas, ornaments, the tree, etc. should be fun to capture teachable moments with this book. 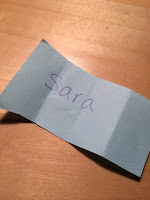 I love Ann Vosskamp... how have your kids liked the Jesse Tree so far? That's fun that you can read the girls books their daddy read as a boy!